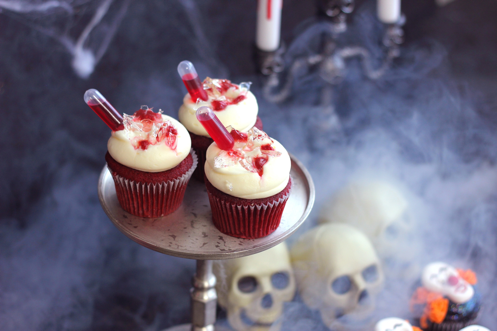 If you live in London and are looking for something different and delicious this Halloween check out Flavourtown’s range of cakes. Flavourtown never compromises on quality and uses only the finest ingredients available; creamy AOP Lescure butter from France, fresh organic free-range eggs, sumptuous Valrhona and Callebeaut chocolate and premium organic flour. With incredible attention to detail, every decoration, sauce and compote is handmade in its North-West London bakery, never bought off the shelf. The amazingly talented Flavourtown team make cakes and cupcakes the only way they know how – by hand and with a meticulous eye for detail, quality and flavour. The bakery only use organic free range eggs from the farm which are accredited by the Organic Growers Association, The Soil Association, RSPCA Freedom Foods and British Red Lion Quality to ensure the hens receive the highest potential standards of animal welfare. The team uses Lescure butter which is churned by hand in the Charentes region in France, Valrhona cocoa powder, the finest chocolates from France and Belgium and the purest vanilla from Madagascar. Flavourtown only ever uses fresh organic fruits and all compotes and curds are hand made in their London bakery.